Despite being more commonly known as the birthplace of surfing, Newquay actually has an even greater history to tell; smuggling tales that would have even the most experienced of historians on the edge of their seats or… Super stand up paddle board! What is our Heritage Super SUP activity? 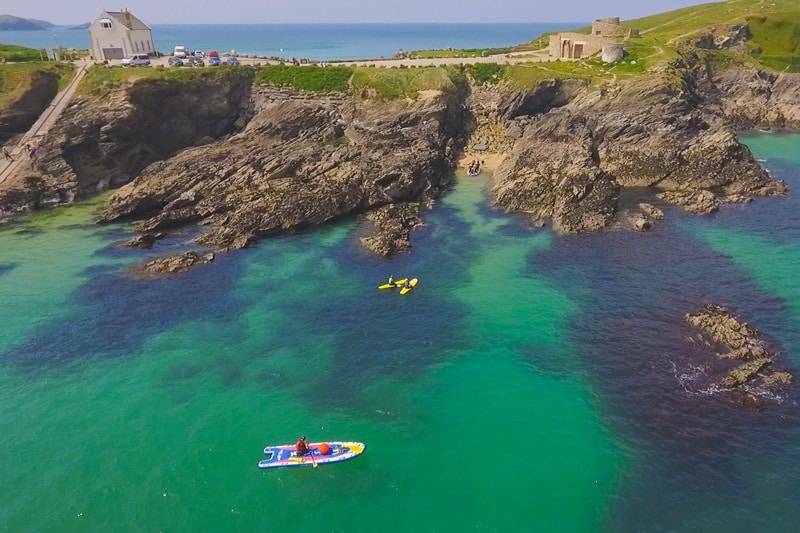 If the BBC were to do another coast series, we’re sure they would be trying our fascinating heritage Super Stand Up Paddle Boarding tour along Newquay’s historic coastline. Your paddle boarding adventure begins at the Newquay Activity Centre HQ where we’ll kit you out in a top of the range wetsuit, buoyancy aid, helmet and pro paddle before launching the Super SUP from Newquay bay. What starts as a leisurely paddle boarding tour along Newquay’s beautiful craggy coastline soon turns into a captivating step back in time, to an era when smugglers, pirates and vagabonds used these secret coves and caves under the cover of darkness to smuggle contraband and treasures into Cornwall. It’s these same shores that hold stories of the rise and demise of the once great pilchard industry in Newquay, heroic RNLI rescues in high seas and old fisherman’s tales from the deep and facts about the biggest waves ever ridden at the Cribbar reef …all to be unravelled on your Heritage paddle boarding tour. In addition to becoming a novice maritime historian, you also get to appreciate the abundance of marine, bird and wildlife that grace this coastline. We’ll moor up for a host of hilariously fun paddle boarding games including Dizzy Stick, King of the SUP all which will help you to up-skill your SUP balance skills and find your sea legs. History needn’t be taught in books, instead it should come alive through discovery, and so what better way than exploring this mythical coastline. You’ll enjoy a gentle workout as you learn perfect paddle strokes, kneel paddling and negotiate ocean swell on this giant craft. No fear though, you can take everything at your own pace. The Heritage Super stand up paddle boarding tour is ideal for a group of history loving friends, a school trip, scout & guide outing or anyone looking for a little peace, tranquillity and a completely different experience.